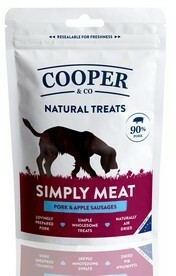 Cooper & Co Simply Meat Pork & Apple Sausages Are Made With 90% Pork. Cooper & Co. Grain Free Pork & Apple Sausages offer a delicious and nutritious treat for your best friend.